The light filters in through the window of the car door; that sort of flashy brilliance from a summer afternoon as signposts and roadside reflectors whiz past on your way from point A to point B. Your headphones are on because your brother whom you are trying to drown out, just retracted that finger that moments ago was only God knows where. He’s crossed that imaginary line dad had pointed out prior to barreling down the driveway with half of your house strapped to the car. Mom might be pointing things out to look out for or talking about the sandwiches in the trunk and lamenting that she should have brought more than 50 napkins for lunch. And your family dog, whom you can’t board because your sister couldn’t bear to be without him, has his head firmly outside the window. He’s lapping up the rush of cool air in his face, relishing the ride and his avoidance of the dreaded kennel. Behold, the family road trip. Kids know how long a movie is or how long an episode of Doc McStuffins will take but trying to explain to a kid that they are traveling for more than two hours and you might find that our automatic response is centered around media as a unit of time. It is a crutch that we too often lean on. We travel tech-free in our minivan. My wife wouldn’t let me put the entertainment system in our Swagger Wagon when we bought it. I argued for it saying it would make travelling easier and she said I would rely on it too much. I am glad she is always right. I have seen so many people just riding to the grocery store popping in a DVD even though the market may only be a few blocks away. The other day, I was trying to watch Star Wars through a Tahoe’s back window pretending that my van was the Millennium Falcon when the TIE Fighter behind me honked and I kicked it into hyperdrive. It’s a distraction and an addiction that our kids just don’t need on every car trip. My family regularly takes a car ride to the Adirondacks which is a group of mountains that aren’t in Pennsylvania where we actually live. The six-hour car ride goes surprisingly fast. How is that possible you may ask? Because we travel tech-free by using a great old school technique: trying to teach our kids to look out of the window. Technology is easy — too easy and accessible. Don’t want the kids to annoy you? Then we put something up on the screen and turn them into video zombies for some peace and quiet. While some apps are educational and have some merit, there is something to be said about putting limitations on the time we spend with technology. What is our obsession with filling every moment with something when there are things all around us passing us by? The American Academy of Pediatrics cites that today’s children are spending an average of seven hours a day on entertainment media, including televisions, computers, phones and other electronic devices and suggests making areas in your home “screen-free” zones. Why not make the car one of those screen free zones and focus on games, books and coloring in the car? Part of learning to turn off the screens and focusing on activities that stimulate your child’s growth is dependent upon limitations that you set for your child. Children learn best early in life through direct interaction with people, so when they sit still and watch TV, surf the Internet or play video games, they aren’t getting the exercise and mental stimulation they need to develop. The car ride is an extension of this time where we have a choice; zone our kids out for some peace and quiet or take hold of the time you have together. It takes effort for sure as I look inwardly, I realize that modeling the right behavior can make all the difference. I try to make an effort in the car not to look at my smartphone and be in the present with my kids. Eliminating all media is not realistic and doesn’t teach kids how to be responsible later. All of this essential family time has come from looking out the window and paying actual attention to where we are going. We’ve noticed a remarkable change in our three year old who randomly will yell out “Red car!” even when we aren’t driving a long distance. Two years ago, I took my son to NYC to sleep over at the American Museum of Natural History. While riding, we talked the entire way and he looked out the window. When we got closer to the city he noticed graffiti from some taggers who had chosen some choice words for names. He asked “What is that artwork doing on the side of that bridge?” So, we had a discussion about graffiti, tagging, and public art; a discussion that never would have happened if his eyes were looking down and not out. Roadside pie stands, a farmer tilling his field, and mountains so big you can’t even imagine how they created the tunnel you are now driving your car through are things my kids see along the way. We spot barns and windmills, license plates from every state. Once, we even had my son write them all down so he could memorize their mottos. We play “In Granny’s Attic” and I Spy. We even crank the radio and jam out as a family or have a reading by the person riding shotgun while we just listen. Whether you are in a car, train, or airplane we can take these moments as opportunities to inspire and challenge our kids to take notice of the world they live in and not just what is right in front of their faces. 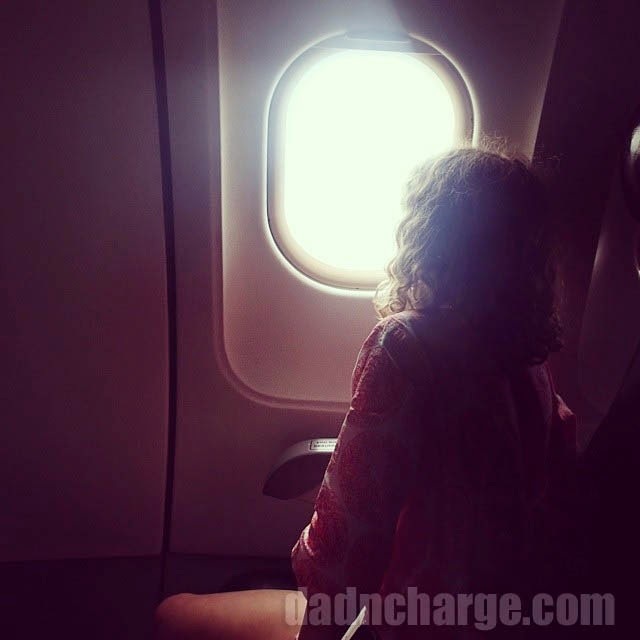 In an airplane, on our way to Chicago this summer my daughter commandeered the window seat. Upon take off she exclaimed “I can see the whole world from here!” That window seat is calling you. It is calling you to look out and take notice. Don’t let it pass you by.